Customising TemplateToaster’s theme is so easy, even after installation. 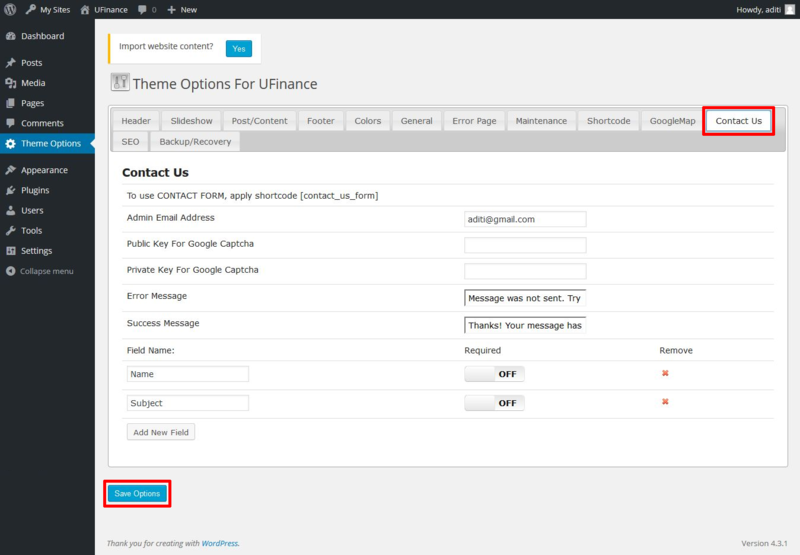 You will see an additional tool on the sidebar of your admin dashboard, under the name “Theme Options”. 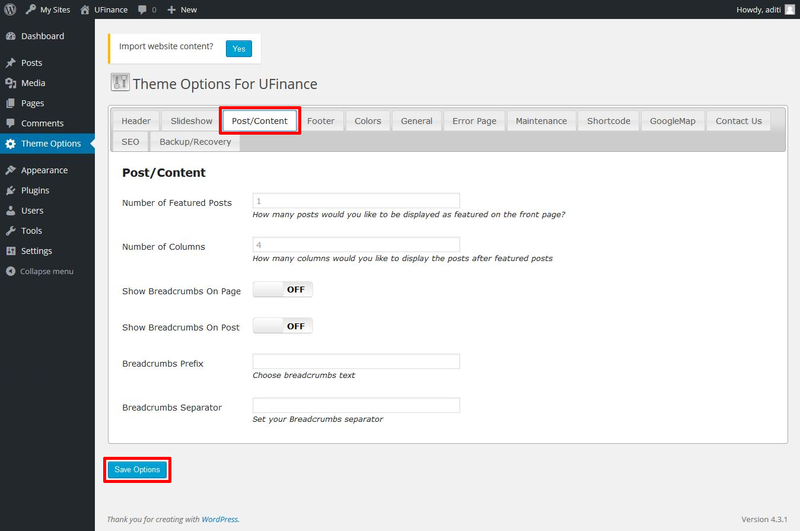 These theme options give you flexibility to change some elements of your theme. Let us have a look at these theme options. This tab shows you the options of Slideshow of your theme. It allows you to replace the images used in the slideshow by uploading new ones, even after installing the theme. This tab contains the options for customizing the post settings. You can specify the number of featured posts to display on the home page of the site. You can specify in how many columns to show the featured posts. Breadcrumbs is basically the type of text-based website navigation that breaks the site into links of categories and sub categories allowing major categories of information to be linked in a sequential order. Breadcrumb navigation is displayed to the user, so that they can easily navigate between the pages. Select the On option, if you wish to display the Breadcrumbs, otherwise keep it Off to hide the Breadcrumbs. You can show/hide the breadcrumb on the post. Set a breadcrumb prefix using this option. You can set a desired separator on the breadcrumb using this option. Places the relevant copyright URL on Copyright Text in footer. Select On to display the Copyright Text in footer, otherwise keep it Off to hide. Enter the required font size for Footer Copyright Text. Enter the required font size for Designed by element in footer. Enter the required font size for Designed by Link Text. You can upload custom Facebook Icon and link with your Facebook account. If you don’t want to display Facebook Icon in the footer, you can turn it OFF and vice -versa. You can upload desired custom LinkedIn icon on footer. Then, specify the URL of LinkedIn account to link with the icon. If you don’t want to display the Icon in the footer, you can turn it OFF and vice -versa. You can upload custom Twitter Icon and link with your Twitter account. If you don’t want to display Twitter Icon in the footer, you can turn it OFF and vice -versa. You can upload custom Google+ Icon and link with your Google+ account. If you don’t want to display Google+ Icon in the footer, you can turn it OFF and vice -versa. 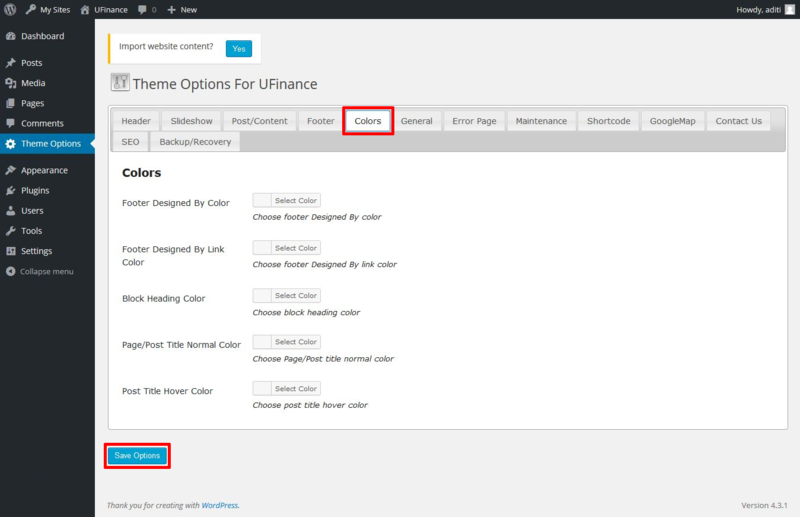 You can change the colors of some elements of the website, which are shown below:. This tab offers you the options of general elements of your website. Use this tab, if you want to enable/disable elements like, Google Analytics, Page Title, Post Title, Navigation, Next/Previous link, Comment display, Avatar, Back To Top Button etc. This tab gives you the options for configuring error page settings like, redirect to home page if Error page occurs, displaying error message and image, etc. You can make use of this tab if your website is going in maintenance mode. You can write the title and content for the maintenance mode page and apply an image in the background, using options available. In this tab, two dozens of the most commonly used shortcodes are available. From this tab, you can get the shortcodes for Google Docs Viewer, Google Map, Related Posts, Google AdSense, Google Chart, Tweet Me Button, YouTube, Private Content, PayPal, Login Form, Custom Menu, Archives, Contact Us Form, Calendar, Categories, Links, Meta, Pages, Recent Comments, Recent Posts, RSS, Search, Tag Cloud and Text. This tab has options to avail you with a Google map on your website. This tab lets you to customize the contact form. You can specify Public and Private key for Google Captcha, can customize Error/ Success message and can add more fields in the form. This tab has important SEO options for your website, which are divided in sub-tabs. It is up to you whether you want to enable the SEO mode or not. From home sub-tab, you can specify Title, Meta Description and keywords of the Homepage. Besides this, you can select the Title formats of Page, Post, Category, Date Archive, Author Archive, Tag, Search and 404. 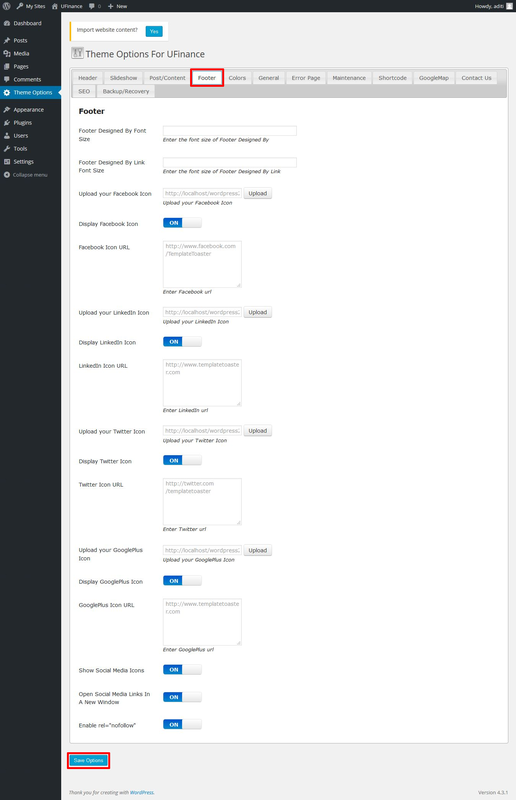 This sub-tab has options to ON (enable)/ OFF ( disable) general SEO features, such as use of Meta Keywords, use of categories as keywords, use of tags as keywords, auto generate descriptions, set No-Index for all pages, set No-Index for all posts and set No-Follow for all pages. Through this sub-tab, you can verify your website with Google Webmaster Tool Bing Webmaster Tool and Pinterest Webmaster Tool. 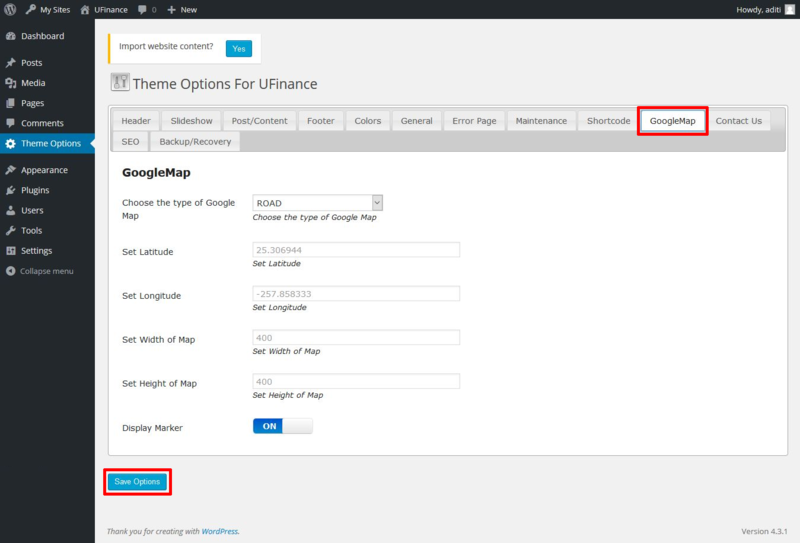 And, you can provide default Google Plus profile, which is required for Google Analytics. 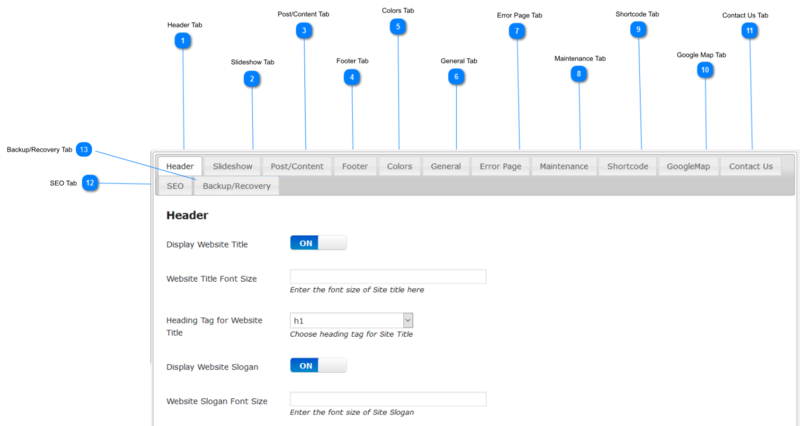 You can see the sitemap of your website from this tab. Also, you can decide whether you want to include Page Type and Post type in the sitemap or not. This sub-tab gives advanced SEO options. Those options allow you to turn ON/OFF the use of No-Index/ No-Follow for different archives, like Date Archive, Author Archive, Tag Archive, Category Archive, Search Archive. And, you can define additional Post and Page headers. 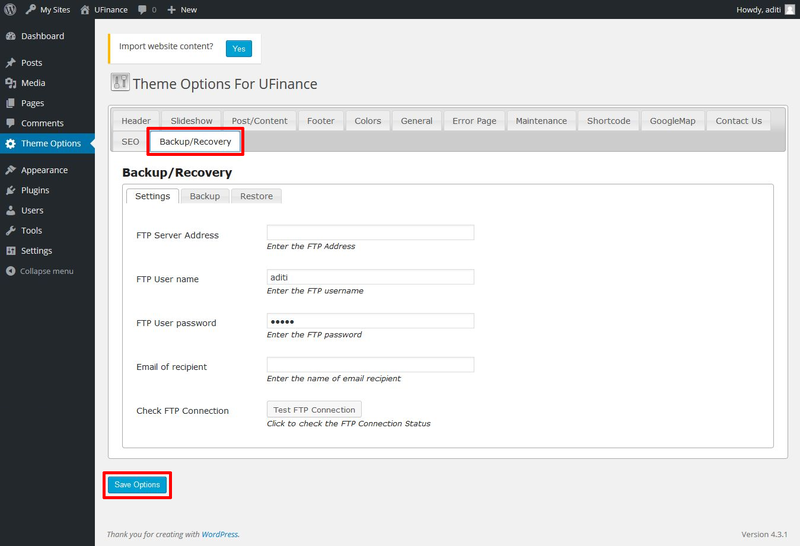 Backup and Recovery is an important feature of TemplateToaster. You need to give the FTP information and an Email address for backup storage and create an automatic backup schedule. The backup of your website will be created automatically according the schedule you’ve made. You can choose automatic backup interval according to your preference, which could be as short as 10 minutes or as long as a week. Moreover, you can choose yourself that which files to include in the backup and which to exclude. Similarly, while restoring the backup, you can select that which type of files to restore and which one to refrain from restoring.